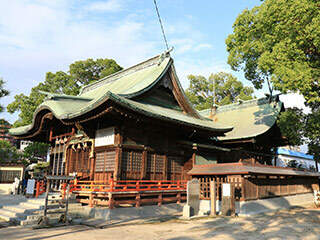 Yoka Shrine (興賀神社) is one of the oldest shrine in Saga city, Saga Prefecture. It was established in 564. There are many traditional buildings and cultural assets. It's been highly respected by the people of Saga. Especially, Nabeshima clan, the lord of Saga, respected as the protector of Saga. Reisai: 4th Sunday of October. Yoka shrine was established in 564. During Kamakura period 1212, Hojo Yoshitoki donated the main hall. During Sengoku period and Edo period, it was highly respectedNabeshima clan and the current main hall was built in 1758 by Nabeshima clan. They are constructed in 1603. Romon Gate　Registered as the national important cultural assets. Constructed in 1482. It shows the features of the architecutre of Muromachi Period. 1400 years old sacred tree of this shrine.